* Locations, maps, photos, salmon fishing & saltwater sport fishing info. 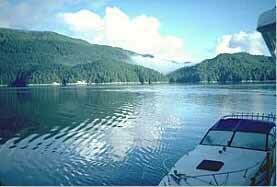 Salmon Fishing British Columbia lodges, guides, charters & tours. Where to shop for gear. TOP RATED in "Fishing's Best Web Sites"
The British Columbia Adventure Network have been ranked as one of the world's best fishing Web Sites by Fishing Online: 1,000 Best Web Sites. The popular guide book has awarded our site it's TOP RATED designation. Promote your business to over 5.5 million visitors per year.